I just got this in the mail yesterday. 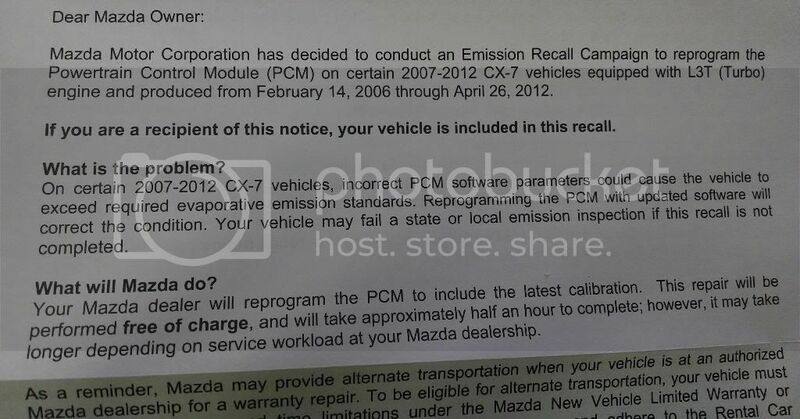 It states that they basically have to flash a new tune on my car if i ever take it to Mazda for service (VVT, Turbo, A/C Compressor, etc) since i have the extended warranty, how will this effect my tune through you guys? I will definitely flash the car back to completely stock before i head to the dealership, but when i flash VersaTune back will i run into any trouble? It should copy the new mazda factory tune & save it to memory, then flash the old VersaTune file back correct? I just want to make sure before it goes to the dealer for anything. @Steve@VersaTune if you could help verify my theory for me. Thanks! This is a good car, a fine family SUV that will serve you well, if unremarkably. It's on sale from 18 May, and its arrival signals the phasing out of the larger CX-7, like the 2 supermini, one of Mazda's underrated, underappreciated cars. Let's hope the CX-5 avoids the same fate. It deserves to. Last edited by lildisco; 02-21-2014 at 01:36 PM. Just got mine in the mail yesterday..
1. Make sure you remember what tune is currently on the car so that you can flash it back later. 2. Remove VersaTuner from the car and return it back to stock. 3. Let the dealer do what they need to. 6. Flash the same tune you noted in step 1. If the platform code hasn't changed, VersaTuner will work fine, however there will be no difference in performance, because VersaTuner always rewrites the ECU entirely, so it will not use the new factory tune. Moreover, we always try to base our tunes on latest factory tunes, so there's a big chance that it will already have the TSB. Got the recall done & i didn't really notice a performance increase or decrease with the new stock tune. It felt about the same to me. I put around 100 miles on it before i flashed back to my Versa Tune. I was able to store/save my previous stock tune as well as save my new stock tune. It took about 25 minutes to save/flash the new stock tune back onto the car. During this time, i was able to put my ETS TMIC & BPV on the car. Pretty easy process to be honest. Thanks Steve & Ugnius!